A unique fast absorbing and antioxidant rich formula sweetened using natural sources. BioSteel’s Vitamin C is a delicious sugar-free, premium quality chewable tablet that is meant to be taken regularly to provide 500mg of nutritionally essential, highly absorbable vitamin C per dose, with absolutely no additives or preservatives. The formula contains a unique herbal blend composed of Rutin, Hesperidin, Lemon Bioflavonoids, Acerola Cherry and Rosehips for enhanced vitamin C absorption and therapeutic effect. When should I take my BioSteel Vitamin C? BioSteel Vitamin C can be taken at any point throughout the day. Vitamin C should be consumed on regular basis, especially during the flu seasons to help support your immune system. 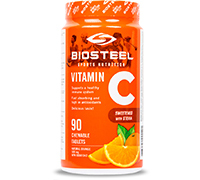 What products should I stack BioSteel Vitamin C with? BioSteel Vitamin C can be stacked with any BioSteel product of your choice. Is there risk of Vitamin C toxicity? No, vitamin C is not stored in fat like other vitamins and will be eliminated by your body via urine. 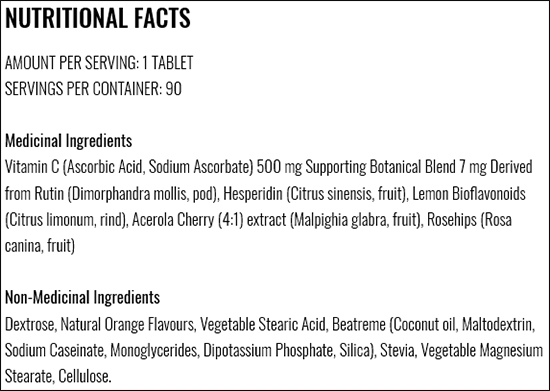 Can I take BioSteel Vitamin C with my medications? Are there any side effects? The best answer can be obtained from your health care practitioner. Please consult a health care practitioner prior to consuming product to ensure elimination of side effects.